Well it is nearly round, and also a bit sad. 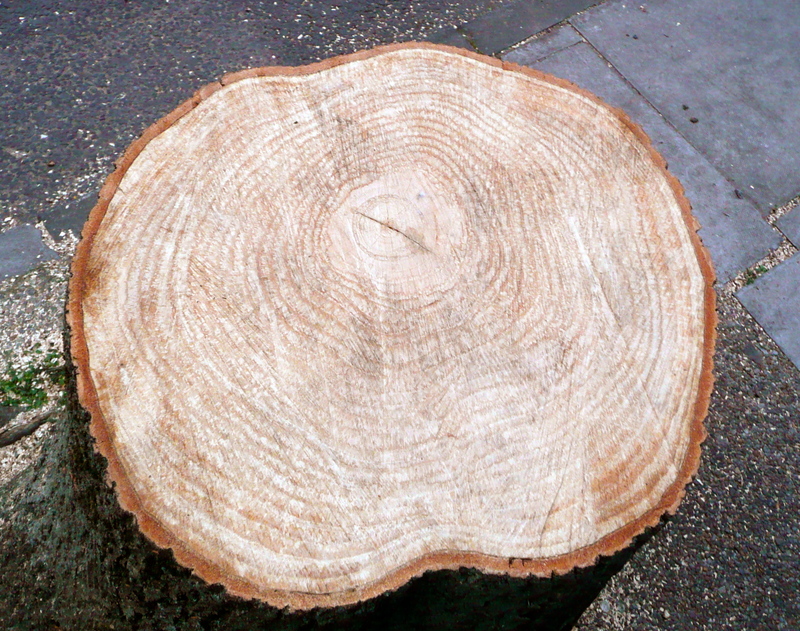 Last week, near our house they chopped down a street tree, a beautiful ornamental ash. It is funny, because about 2 years ago, when the council said they were chopping the one that is outside our house, we and the neighbours threatened to chain ourselves to it, and it got a stay of execution. Sadly the people who lived next to this tree were possibly not so bothered, or just imagined it was a fait accompli, or they wanted rid …who knows. I hear that there was a very innovative head of trees in our borough in the 1970’s- the time when the trees in our road were planted. We have some amazing trees scattered about the madness and traffic that is my manor. She particularly helped the main A1 road in Holloway from being a complete hole, the trees are magnificent, and help so much. I have watched them grow over the last 30 years. The Nags Head Holloway is a far far better place for the trees. Take note Kentish Town Road which is treeless and bleak. Trying to think of a song with wood in the title…this is the best I could come up with…..
Shoulda Woulda Coulda -Beverley Knight. Written by her too! what a talented woman she is. The video was shot in the Hout Bay area of Cape Town, South Africa by director Douglas Avery.The location for the video was of special significance to Beverley. She had visited previously in connection with her charity work in bring awareness to HIV in South Africa. Categories: LONDON, postaday2011, Song of the Day, Thumbs Up!